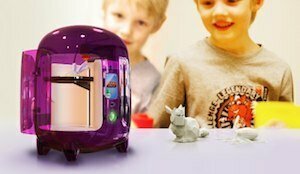 The Origo Kid’s 3D Printer: “I’m purple and make your stuff. We spend a lot of time thinking about how 3D printers will change the world. Manufacturing, retail, medicine… What about some plain old fun? And speaking of fun, what about the kids? Heck, they’re the ones with all the imagination. And isn’t that part of what 3D printing is all about – capturing your imagination in real, physical creations? What we should do is give inexpensive, easy-to-use 3D printers to children. Give them a simple design program to go along with it and let their imaginations run wild. Get all that great, wild and wacky stuff that’s in their heads and bring it all into the physical world. It’s such a great idea, that two 3d printing experts, Joris Peels and Artur Tchoukanov, have already teamed up to design what they call the Origo, a “toy 3D printer. It’s not in production yet, but looking at their website gives me the confidence that it will become reality in the near future. If that were a Play-Doh Factory, it could have been a photo of the author #$%! years ago. The Origo looks something like a space-age minibake oven. But it’s actually going to be quite a sophisticated unit, for a toy. It will be geared towards kids about ten years old, but it’s the kind of toy that mom and dad will want to play with once the kids go to bed. Kids will be able to design their idea with a simple program, and then print it out on their Origo 3D printer. You don’t have to be ten to use me, but it helps. Sure adults are older and can do lots of different things such as drive a car and use a drill. But, adults aren’t really good at imagining things. They’re afraid. Afraid of failing, afraid of not making the perfect thing. They see the world as it is, not as it could be. They see what can’t be done, not what could become. Kids are not afraid. They’ll draw anything and everything. They’ll make whatever it is they feel like. They’ll imagine, dream and create. And that’s what I’ll help you do. You could share me with your brothers, sisters and parents and make together. You could teach them how to make the world as they want it to be. Most of all though, I’m a tool for you. The hardware is coming down in price rapidly, but the thing that could have held back a product such as this is the complexity of the design software. A ten year old, well most ten year olds, isn’t going to be able to handle a CAD/CAM program to design their ideas. Fortunately, with the advent of the super-simple, web-based 3D modeling design program 3Dtin, even kids can become designers. This software will be bundled with Origo. It’s free, and you can try it out now. Founders Joris Peels and Artur Tchoukanov have their business plan ready, their prototype built, their research done, and are raring to go. The only thing missing is a minor detail called funding. They don’t have it yet, but with such a great idea and the publicity they are getting in tech blogs this week, I don’t think it will be long before some venture capital comes their way. Good luck, guys. And by the way, great job on the video.